miniSIPServer V21 or abover version can support this feature. In MSS, no more than 3 phones can register to MSS with same number and authorization by default. Each phone can make outgoing calls independently. For incoming calls, all these phones will ring at the same time, and other will be disconnected automatically if one of them picks up the call. In above scenario, if the user (for example B1) in living room has picked up the call, and another user (for example B2) in dining room wants to join them, that means there will be a simple conference in fact. The user B2 can dial "*74" to do that. By default, the service isn't enabled in local user's configuration. If you want to connect several devices with same number, you need configure its service right in local user's "supplementary service". Please refer to following figure for more details. 3.1 Can I limit maximum outgoing call for my phones? Sure, you can. 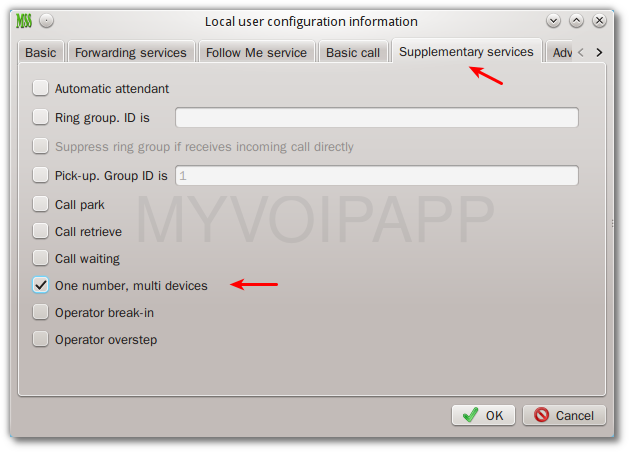 Since all phones are using same local user's configuration, you can configure such local user to limit its outgoing call. 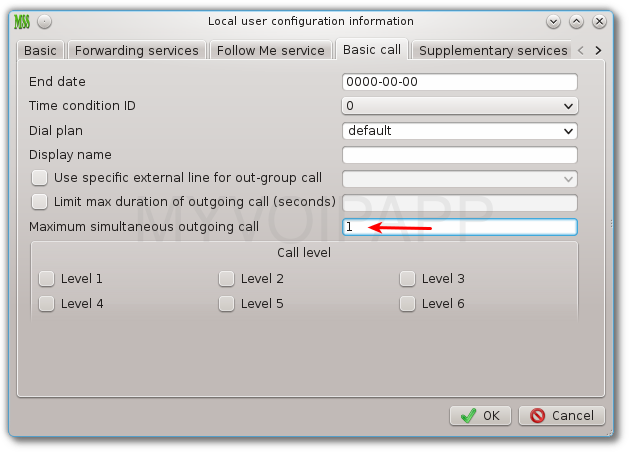 In local user configuration dialog, please click tab "Basic call" and configure "maximum simultaneous outgoing call" item to fit your requirement.Please refer to below figure. 3.2 Can I ring these phones in different order? No, MSS can only ring all of them at the same time. If you want to ring them in different order, you need "follow-me" service. 3.3 Can all phones in one-number service join the same call? No, you can't. MSS can only support three parties conference.